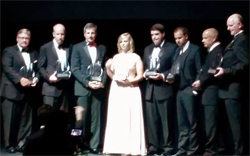 The award recipients were announced June 16 at a special gala at Arvest Bank Theatre at the Midland in Kansas City, MO. The EY Entrepreneur Of The Year Program recognizes business leaders in over 145 cities in 60 countries throughout the world. Founded and produced by EY, the Entrepreneur Of The Year Awards are sponsored nationally by SAP America, Merrill Corporation and the Ewing Marion Kauffman Foundation. Award winners in several national categories, as well as EY’s Overall National Award winner, will be announced at the EY Entrepreneur Of The Year National Awards Gala in Palm Springs, California on November 19, 2016.